The problem with most economic data and company profit announcements is that they are backward-looking, while the share market is forward-looking. That is why we place so much emphasis on leading economic indicators that are designed to lead the business cycle by up to a year. 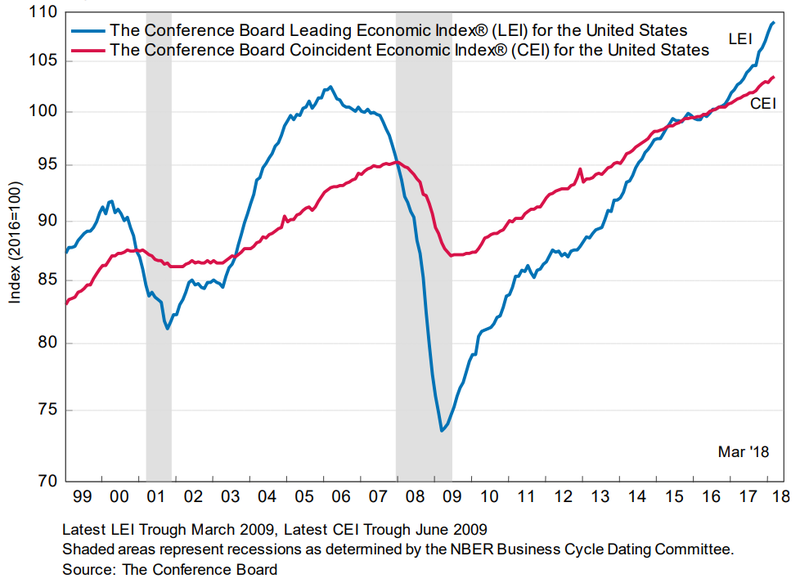 The Conference Board's latest US Leading Economic Index (LEI) for March was released last week. It increased by 0.3% to 109.0 (2016 = 100), following a 0.7% increase in February (revised up from +0.6%) and a 0.8% increase in January. The LEI is a composite of ten variables that lead the business cycle by 6 to 12 months. The business cycle is represented in the chart below by the Conference Board's Coincident Economic Index (CEI), a composite of high-frequency economic data that are coincident with GDP. The shaded areas in the chart show the official US recession periods. During recessions the CEI is falling, having been foreshadowed by earlier falls in the LEI. Average consumer expectations for business conditions. The share market discounts future growth in earnings and is therefore forward-looking in nature. Inevitably, it attempts to forecast the future direction of the economy. Bear markets precede recessions, often before they are obvious. 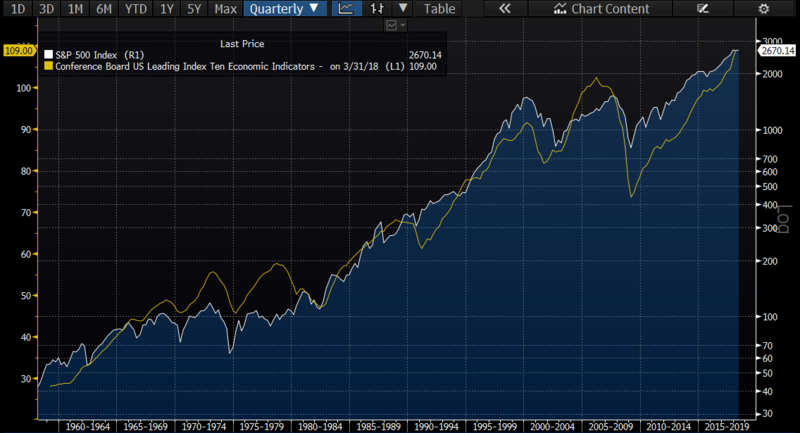 The LEI has historically turned downward before a recession and upward before an expansion. It has generally proved capable of predicting recessions over the past 50 years. Three consecutive monthly declines in the LEI is normally considered a bad sign for the share market and the economy. In the current context, consecutive rises are being recorded. The relationship between the Conference Board LEI and the US S&P 500 Index can be seen in the chart below. Both are forward-looking, anticipating changes in the economy before they occur, therefore they are fairly coincident with each other. A falling LEI will generally confirm a bear market rather than lead it. Likewise, a positive turn in the LEI will confirm when it is safe to buy back into the market. No indicator is perfectly reliable. Very rarely the LEI has predicted a recession that did not occur. The share market has done so more often, but the false signals tend to be short-lived. The US and global economies are growing and the latest US earnings season has started well. Of the S&P 500 companies that have already reported, 80% have delivered a positive EPS surprise and 72% have delivered a positive sales surprise. For Q1 2018 the total earning growth rate is expected to be 18.3% year-on-year (revised up from 17.1% at the end on March), with a boost coming from the lower corporate tax rate. The main negative for the share market at the moment is having to absorb a higher bond yield, with the US 10-year Treasury yield now near 3% . Fortunately, the US 12-month forward PE ratio has come down to around 16.46x (from a high of 18.57x) due to a combination of the recent equity correction and earnings upgrades. Consequently, the US equity risk premium is still reasonable at around 3.10% [= 100/16.46 – 2.977%]. Provided the US economy and earnings continue to grow (as implied by the rising Conference Board LEI), and bond yields do not rise by more than say a cap of 100bp from here, the equity market should be able to resume its advance. Great article - thanks Is there anything similar that relates to the ASX?